For the uninitiated here’s how Jack describes herself on her blog, A Girl Called Jack -‘Cook, campaigner, Guardian journalist, mother, author, etc. Winner of…’ and then follows a list of her seven major awards to date. She found fame after writing a post entitled Hunger Hurts on her blog in 2012 telling how she sold off most of her possessions to raise money to feed her toddler when her benefits were continuously sanctioned. She is a woman of our lean times, the queen of austerity survival and has, well… moved on. That’s two books in one year and she’s already busy writing her third. I ask Jack how she feels about the critics who are saying she’s ‘poshed up’ and left her original audience behind. Jack’s unlikely to give a tossed salad about her critics though. She’s had so much stick along the road to fame that nothing much riles her any more. Her Twitter trolls are legendary with people attacking her for everything from her looks, tattoos and lesbianism to the fact that she recommends budget bacon. Then there was the verbal thrashing she got from Edwina Curry on Channel 5’s Big Benefits Row Live. And Waitrose-gate, lest we forget that. The supermarket chain ended up with egg all over its face (ooh look, I made a connection with Edwina there). They had to apologise to Jack after daring to airbrush her tattoos from their magazine feature. I ask Jack if she now has a team behind her, someone to answer her emails, write her blog, Tweet for her when she’s all Tweeted out but she says no, she’s still a one woman show. I also want to ask if she’s still only paying herself the living wage and if she now has a cleaner but I get the feeling that the move to girlfriend Allegra McEvedy MBE’s house has made my questions irrelevant. Allegra looks like she would have a cleaner by birthright. Jack adds that the absent parents of both children would prefer it if the children are kept out of the books and the papers. I ask how Jack gets on with Allegra’s ex-wife (and Delilah’s mum) Susi and she says they all get on like a house on fire. All four parents, including Jonny‘s dad, hang out together some weekends “because that’s what the kids want”. Bloody hell, I’m so impressed that all the grown-ups are acting like…well, civilised grown-ups. I mention that I’d spotted a pile of Jack’s first book, 100 Budget Recipes, at one of the food banks in Nelson. I ask her if Penguin will be sending out copies of her new book to the food banks as well. At £18.99 it’s unlikely that anyone living on a limited food budget will buy a copy of the book. Even if it’s discounted to £9.50 on Amazon or through one of the major supermarkets. Amazon is one thing I am mustard keen to ask Jack about. Their employment practice, reluctance to pay corporate tax and their grim reaper attitude to small publishers and independent bookshops is so atrocious that I rather hoped Jack would have refused to sell her books through them. HIVE do offer some discount on the hefty retail price but will really only appeal to those who can afford to put ethics before cost. Those independent bookstores that HIVE represents are dwindling thanks to companies like Amazon. For the life in me I can’t remember how I know about it or where I saw the image. When I try to find it again it seems to have disappeared into the internet ether. If producers think the public would switch off a series featuring Jack’s daily life encompassing the cooking, the MBE girlfriend, the tattoo parlour, the busking on street corners with Billy Bragg to appearing on Question Time then I think someone in telly needs sacking. 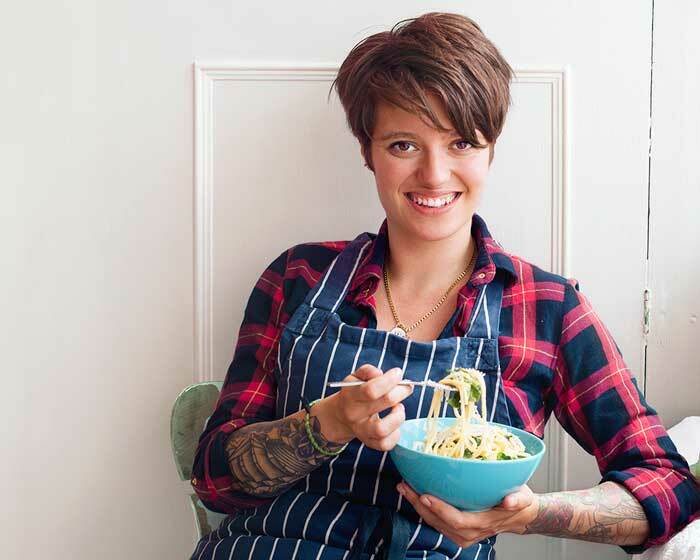 Jack Monroe – A Year in 120 Recipes is slick and a little bit saucy in places. There’s an excellent recipe for peanut butter bread, tried and tested by myself. It also has a couple of suggestions for those radish tops which I’ll bet you have all been throwing away for years. Priced £18.99 or less and available from your local, friendly bookshop as well as other less friendly places.